Movie stars flash them on the red carpet, president’s wives carry them to the inauguration ball, and collectors snap them up at vintage couture and jewelry auctions across the country. While the head might argue that you can get by with just one, the heart knows that you can never have too many of these glittering minibags in a hundred clever forms; one leads to another and a collection grows. The whimsical designs of the minaudieres are far too charming to keep in a drawer. The form seems to have been developed by jewelers; Charles Arpels made one for socialite Florence Gould in the 1930s. The lip-smacking name “minaudiere” comes from a French term for silly little trifle, and the small size of the Leiber examples – dimensions under 6 inches – means only a few necessary items can be carried within. The artist designed elegant leather handbags for daywear, but the evening bags completely covered with handset crystals and semiprecious stones attract the most attention. Judith Leiber bags from a 300-piece collection assembled by Louisiana philanthropist Bernice Norman were sold in a landmark 1999 charity auction to benefit the New Orleans Museum of Art. Judith Leiber was present for the sale, hosted by New Orleans Auction Galleries, and even purchased some of the purses back to put in her personal museum. The minaudieres, as opposed to the also very desirable “day” bags, brought the most money. 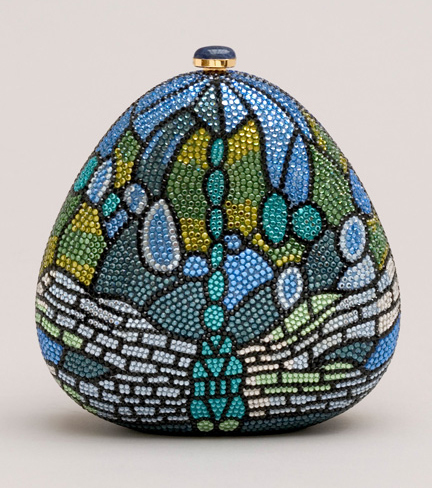 Those featured in the book Judith Leiber: The Artful Handbag (1995) by Edith Nemy sold for even more. 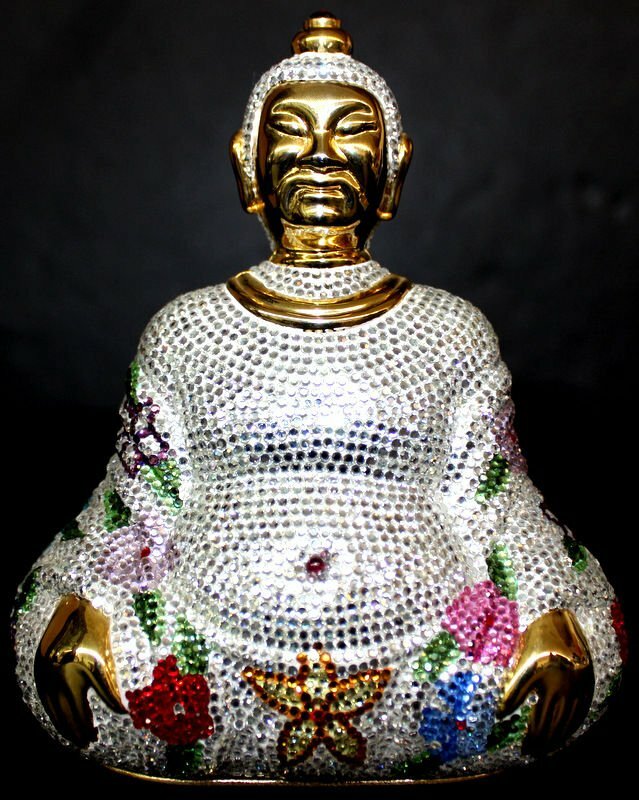 Judith Leiber’s interest in Asian art is reflected in this crystal-studded Buddha design sold at a Bruce Kodner auction in Lake Worth, Florida. It is 5 1/2 inches high. Judith Leiber, nee Peto, was born in Budapest in 1921. Her hopes of studying chemistry in London were thwarted when war broke out in 1939. She joined the Hungarian handbag guild and worked her way up to master status, learning every aspect of construction. Her family survived the war, and at its conclusion she met and married American G.I. Gerson Leiber. After moving back to New York, she exercised her expertise at several accessories firms before founding her own in 1963. Her designs received a number of prestigious awards. Fashionable stores carried the bags, and the New York Times did a lengthy story on Leiber in May 1996 after she opened her own boutique on Madison Avenue. Christine Cavanaugh, the actress providing a voice for the central character in the movie Babe, had carried a jeweled pink pig minaudiere on the Oscar red carpet that year. Judith Leiber is now retired from active designing, but the firm bearing her name continues to produce both old and new shapes, which are carried in stores such as Saks Fifth Avenue, Neiman Marcus and Bergdorf Goodman. Leiber drew inspiration from many sources; the dragonfly on this 1992 minaudiere in the Leiber Collection Museum is similar to the winged creatures on classic Tiffany lampshades. Courtesy the Leiber Collection; photo credit Gary Mamay. Judith Leiber evening bags were always luxury items intended for wealthy partygoers who wanted their outfits to be noticed; new creations with the brand name easily bring $5,000 or more. 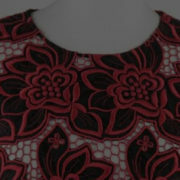 So vintage examples can be viewed as an opportunity to acquire something marvelous at a reasonable price. Minaudieres are equipped with a concealed shoulder chain, which can be used to carry the evening bag. This rare Venetian mask design was auctioned by Bruce Kodner Galleries. Most Judith Leiber evening bags have been well cared for and retain their original accessories – a coin purse, standing mirror, tasseled comb, and soft storage bag. 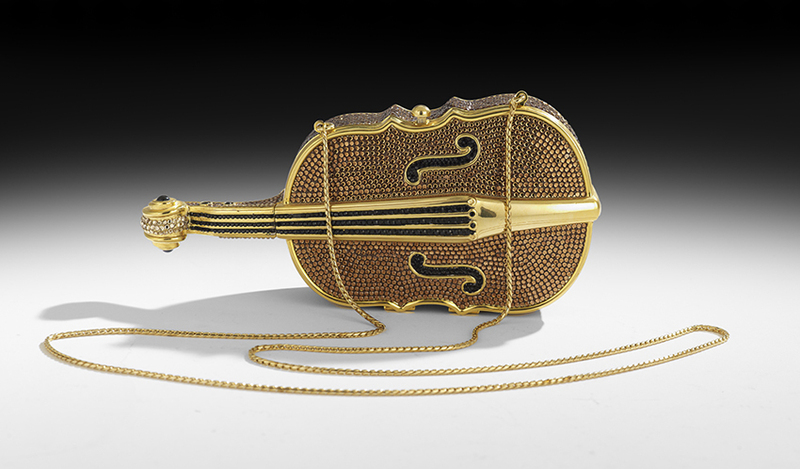 This violin-form minaudiere covered in Swarovski crystals came complete with original coin purse, comb, and mirror. 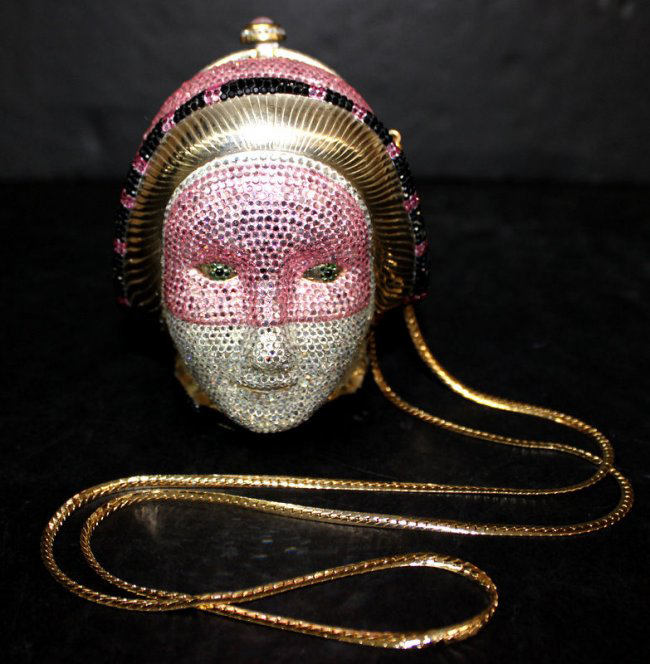 The evening bag sold at New Orleans Auction Galleries. Some Judith Leiber evening bags still have the store’s price tag and the designer’s certificate of authenticity. Restoration services are available if stones are missing from their settings. 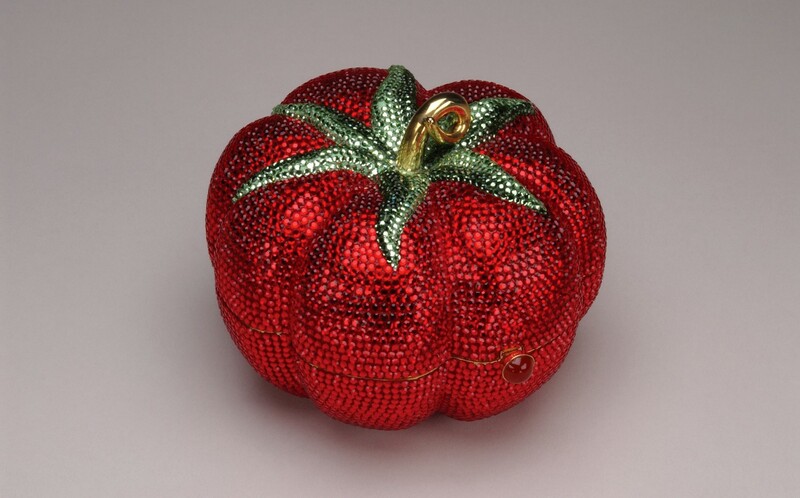 The Museum at FIT, the Fashion Institute of Technology in New York City, has around 45 Judith Leiber bags in their permanent collection, including this bright 1994 tomato minaudiere design. There, students can examine how the bags are constructed. Colleen Hill, associate curator of accessories, said in a recent interview, “There are a lot of whimsical handbag styles throughout the 20th century. Although Leiber did do many different styles of bags, these jeweled minaudieres were what she was especially well known for – they’re conversation pieces. The craftsmanship is absolutely the thing that I like to point out. Everything is really perfect, everything lines up exactly. 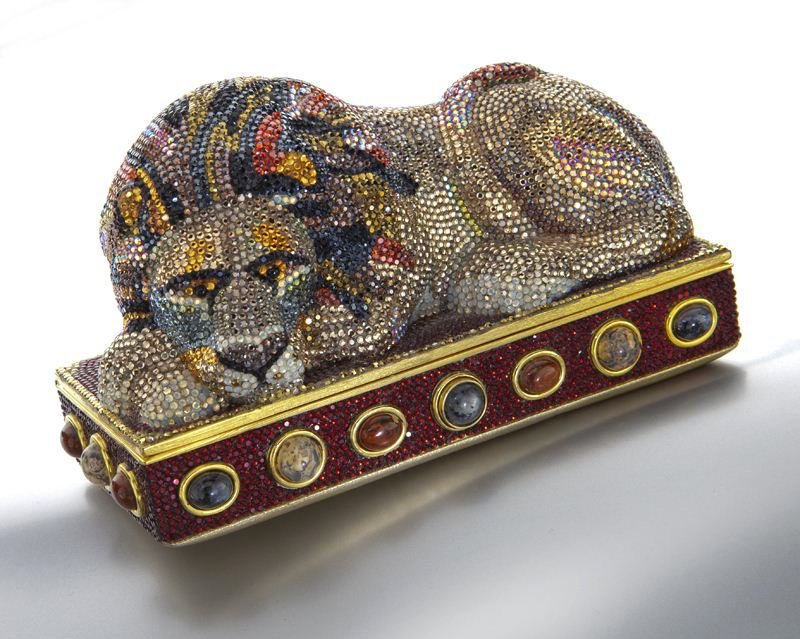 In one of its past sales, Dallas Auction Gallery offered this 6-inch “Sleeping Lion” minaudiere covered with tawny crystals and multicolored cabochon hardstones. 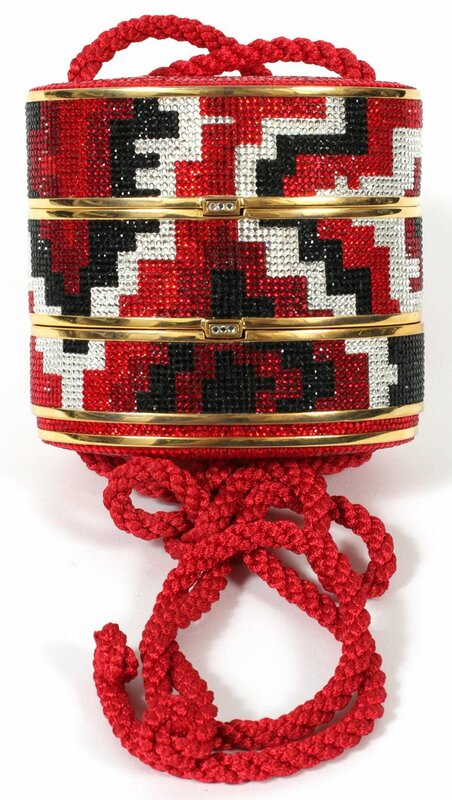 The form of Japanese inro, a container for small objects hung from a sash, inspired this tripartite beaded minaudiere with red silk cord and a gold leather lining. The colorful purse starred in a DuMouchelles auction in Detroit. In 2005, Leiber and her husband Gerson, who was a Modernist artist, opened their own museum and sculpture garden in the East Hampton village of Springs, New York, near the tip of Long Island. (www.leibermuseum.org). Works by both artists – including many handbag designs – are on view in the galleries and a history of their entwined careers can be found in No Mere Bagatelles: Telling the Story of Handbag Genius Judith Leiber & Modernist Artist Gerson Leiber by Jeffrey Sussman (2009). This article, written by Karla Klein Albertson, originally appeared in Style Century Magazine, now part of Auction Central News (www.auctioncentralnews.com).